Kurz announced new DM-Liner foil overprinting metallization finishing solutions for HP Indigo digital press labels and commercial printing. The Kurz DM-Jetliner, a digital pre-print foil unit integrated with the HP Indigo 6900 Digital Press and additional narrow-web models, simplifies the production of high-value labels with metallic effects in one pass, on a wide range of substrates, all at full press speed. For commercial printing, a new version of the DM-Luxliner can be used off-line for HP Indigo B2 sheet-fed presses including the HP Indigo 12000 HD, HP Indigo 12000 and HP Indigo 10000 Digital Press. The Kurz solutions are making their worldwide debut at the HP Indigo Global VIP customer event on February 12. The full capabilities of the finishing units will be demonstrated with HP Indigo machines. The DM-Jetliner is suitable for self-adhesive labels made from a wide variety of plastics and coated papers, and processes roll widths of 150 to 350 millimeters. 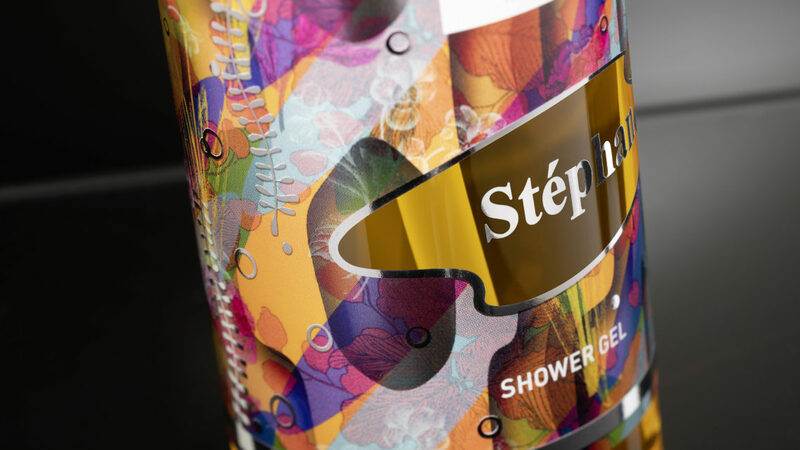 The key feature of DM-Liner finishing is its flat, color printing equivalent application of the metallization, which makes problem-free multi-colored overprinting possible. Thanks to the non-bulkiness of the coating, DM-Liner finishing is also predestined for use in web-fed printing. Rolls in any required thickness can be finished. The Kurz solution also offers diffractive designs and continuous holograms. These serve not only as decorative eye-catchers, but also provide a barrier to counterfeiting. “Web-fed digital printing is the ideal solution for meeting the increasing demand in the labels sector for personalization and serialization, short runs and versioning, right through to individualized designs,” said Markus Hoffmann, Senior Vice President at Kurz. The first HP Indigo 6900 Digital Press with an integrated pre-press DM-Jetliner has begun beta customer testing. Further installations at beta test customers are planned for 2019. Sheets finished with the standalone DM-Luxliner can now be foil overprinted with high registration accuracy of +/- 100 micrometers using HP Indigo B2 sheetfed presses thanks to an HP Indigo software-controlled registration adjustment. Sheets can be overprinted in a multitude of ways, including pre-print and post-printing. At the HP Indigo customer event, Kurz will be demonstrating the full capabilities of the finishing units when combined with HP Indigo machines. Three different live applications will be presented on an HP Indigo 6900 Digital Press with an integrated DM-Jetliner: Colorful shower gel and smoothie labels will be personalized in radiant metallic tones, and a limited edition gin label luxuriously decorated – the elegant and colorful labels turn these products into joyful companions in everyday life. VIP event tickets with sparkling personalizations and a counterfeit-resistant holographic design of brilliant image sharpness will be finished on a DM-Luxliner, and overprinted with an HP Indigo 12000 HD Digital Press. Furthermore, a luxuriant book title design with a fascinating interplay of print colors and metallization will be produced. Softly gleaming metallic motifs shimmer through lush colors and change their appearance as the incident light changes. A glittery rainbow foil adds additional color accents. Print finished outline lettering clearly demonstrates the registration accuracy.